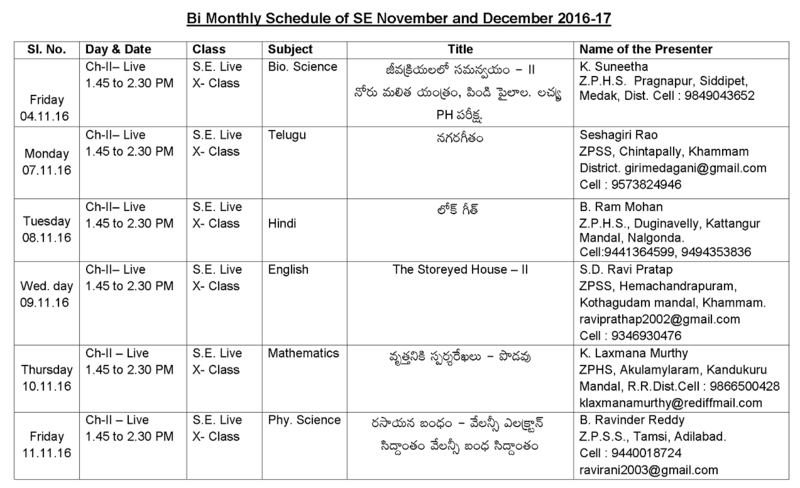 T SAT MANA TV Lessons Schedule: TS SCERT Director, Rc.No.73/ET/SCERT/TS/2015, Dt 16-01-2016; Subject: ET Dept-Strengthening of AV Education-MANA TV-Telecast of Live and Recorded lessons for school Education and Teacher Education for the year 2016-17 -Schedule Communicated - Regarding . Annual schedule of the Programmes is here by Communicated for further course of action. In this connection the Director, SCERT is inaugurating lessons at MANA TV studio on 18-01-2016 at 9.45 a.m with an inaugural address. Therefore, the D.E.Os, and the Principals of DIET/CTE are requested to bestow their personal attention and inform the same to the Schools and field functionaries and ensure teachers, teacher Educators and students view the lessons. 2016-17 - Schedule Communicated - Reg. The attention of the District Educational Officers and the Principals of DIET/CTE is invited to the subject cited above and they are hereby informed that MANA TV lessons for school Education and Teacher Education commence its telecasted from 01-07-2016 onwards for the year 2016-17. 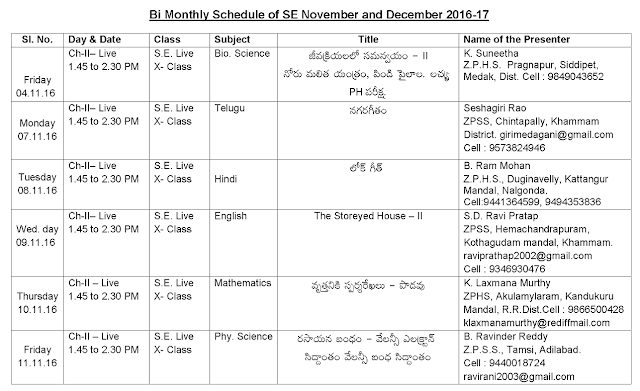 Bi-monthly schedule of the programmes is here by communicated for further course of action. A. 10.00 AM to 10.45 AM for Teacher Education (D.Ed., B.Ed., in-service teachers). B. 01.45 PM to 02.30 p.m. for School Education (Class Vl-X). TS SCERT Mana TV Lessons - Live telecast of lessons from 01-11-2016 onwards certain instructions - Reg. Ref: Approval by the DSE in the file. The District Educational Officers and the Principals of DIETs, CTE & IASE and principals of Pvt. D.El.Ed. Colleges in the State are hereby informed that the live lessons are being transmitted from 01.11.2016 for class X and for D.Ed. & B.Ed. through Mana TV studios. Day-wise transmission of Mana TV lessons for SE & TE is given below. Therefore, the DEOs and the Principals are requested to bestow their personal attention and issue necessary instructions to HMs to incorporate in their time table to view the lessons and furnish feedback report on every week i.e., on every Saturday. Further, the OEOs, and the Principals are requested to relieve the live presenters one day before on their presentation day shown in the schedule. Copy of schedule is enclosed. Encl. : Bi monthlySchedule for November& December. SCERT Telangana,Rc.no.85,Dt:30/08/2016: The District Educational Officers and the Principals of DIETs, CTE & IASE and principals of Pvt. D.El.Ed. Colleges in the State are hereby informed that the Pre• recorded lessons are being transmitted from 01.07.2016. Now, live lessons are also going to transmit from 01.09.2016 onwards. 3 lessons for class VI - X and 2 lessons for D.Ed. & B.Ed. will be transmitted every day from 01.09.2016. Transmission of live lessons will be inaugurated by Director, SCERT with inaugural address at Mana TV studios. Day-wise transmission of Mana TV lessons for SE & TE is given above. Therefore, the DEOs and the Principals are requested to bestow their personal attention and issue necessary instructions to HMs to incorporate in their time table to view the lessons and furnish feedback report on every week i.e., on every Saturday. Further, the DEOs, and the Principals are requested to relieve the live presenters one day before on their presentation day shown in the schedule. I came to know about your channel recently.I am a student of class 10.i wnt classes once again which u have revised in mana tv in nov,dec. Simply go to through Youtube..
first Open Youtube and enter the "http://www.youtube.com/softnetmanatv"